“Minster” means monastery, and they say the Kidderminster name means monastery on the river. That makes sense. St. Mary’s is the oldest church in the area, and tradition was to build churches on the site of older ones. It sits on the Stour River not far from the ancient market center of town. But jumping ahead to the Allens. 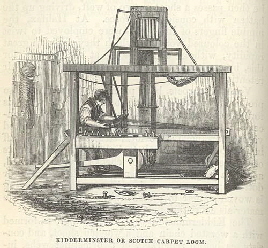 Kidderminster was known in England for its cloth weaving since early medieval days before jousting and armored knights, and became a center for carpet manufacturing around 1735 when the first factory began manufacturing carpets. Before this, cloth and carpet weaving was a cottage industry where hand looms were operated in the homes and attics of individual weavers. “Our family were all weavers and came from Scotland to Kidderminster,” Richard Allen wrote in 1904. “Father used to tell us that his Grandfather always wore the plaid and kilt, highland Scotch style, after they came to Kidderminster.” Richard, who brought his family to American in 1856, was one in the third generation of Allens to be born in Kidderminster, near Birmingham in the Worcestershire area. Based on known facts and remaining memories, the old Scot was probably born around 1730 to 1740 in the Scottish Highlands, and probably brought his family and his weaving skills to Kidderminster after 1770. Nothing else is yet known about the old Scot named Allen. In the same letter to his daughters, Richard stated that, “Father said that some of the Allens was [sic] still in Edinburgh, Scotland, and owned snuff mills…” but he didn’t know who they were. Richard said there was very little he knew about his ancestors, but he wrote that his father told him [before 1856] that other Allens kept a tavern at Nottingham, England, called “The Sign of the Robin Hood.” To those in Kidderminster no occupation was more prominent than weaving. By 1772 eleven master carpet weavers operated 250 carpet looms, not including bombazine, silk and worsted looms. Bombazine weaving ended during the early 1800’s. By 1807 the town boasted of 1,000 looms weaving carpets, and thirty years later there were 24 factories and 2,000 home-based looms throughout the city. But the introduction of steam changed everything. By late in the last half of the 1800’s all carpet production was factory driven and powered by steam. The change was devastating for the workers. Times were always hard for weaver, but never more so than when the factories controlled their wages, their food and their families. They were known for standing up for their rights when factory masters reduced their paltry wages. In 1789 and 1817 the weavers went on strike, but in 1828 the industry in Kidderminster almost died when 2,000 weavers walked out for five months. The masters decided to reduce wages by 17 to 25 percent (depending on the account) to offset growing competition. In the end the weavers lost and returned to work. Not only did they lose wages, but the remaining masters instituted a back breaking 12 to 12 shift to make up for lost production. Several leaders of the strike were brought up on charges, but were successfully defended by Robert Godson. Only one spent a year in goal. The start of the Industrial Revolution in England changed the way simple people would survive, and the people couldn’t keep up. This is the town, the times and occupation that my great great grandparents left behind. Before 1735 independent weavers controlled not only the hand loom, but the entire process of carpet weaving. Robert Godson became a prominent barrister, and later a member Parliament, after defending the organizers of Kidderminster’s Great Strike of 1828. By the end of the 1800’s, weavers operated large factory-based hand looms such as the Axminster carpet loom owned by Templeton and Company. 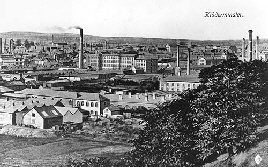 By the 1880’s Kidderminster was a factory town and the independent hand loom carpet weaver had disappeared. © 2016, Bill Draper. All Rights Reserved.